He has been on a hunger strike for 100 days. 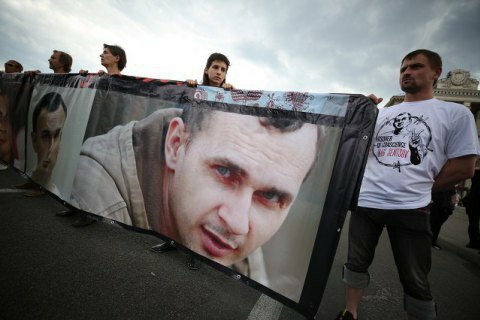 The Ukrainian Foreign Ministry has once again called on foreign partners and international organisations to step up pressure on Russia to secure the release of Ukrainian film director Oleh (Oleg) Sentsov and other Ukrainian political prisoners held by Russia and in the occupied territories. Sentsov has been on a hunger strike in a Russian prison since 14 May demanding the release of Ukrainian political prisoners. "Oleh Sentsov has been on a hunger strike for 100 days. Horrible figure. A human life is the utmost value. We demand that Russia immediately release Oleh," the spokesperson for the Ukrainian Foreign Ministry, Maryana Betsa, has tweeted. "We are calling on our partners and international organisations to step up pressure on Russia to #SaveOlegSentsov and secure the release of Ukrainian political prisoners in the Russian Federation," she added. A court in Russia's Rostov-on-Don sentenced Sentsov to 20 years in a high-security penal colony on terrorism charges which are widely seen as made-up. He is serving his sentence in Labytnangi, Arctic Russia.